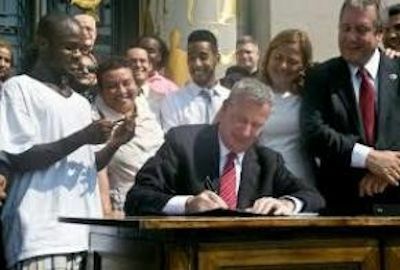 [CMC] – New York City Mayor Bill de Blasio has signed legislation to create a municipal identification card for Caribbean and other immigrants living in the city, including undocumented persons. “Even for those who already have IDs, we’re going to make sure that this card brings a lot to the equation, a lot of benefits that will go with it,” said deBlasio, whose wife Chirlane traces her roots to Barbados. “But for those who don’t have ID, it’s going to be crucial,” he said when signing on to the new law Thursday. Although de Blasio originally wanted the ID card law to roll out before the end of the year, it’s now scheduled to launch in January, the New York Daily News reported. The mayor assured undocumented Caribbean applicants for the new ID card that they will not be asked about their immigration status. “We want all New Yorkers to feel very comfortable working with the police,” deBlasio said. “We want them to be very able to identify themselves to the police and do it in an atmosphere of safety. “This is going to play a crucial role in deepening the relationship between police and community, including a lot of our immigrant communities,” he added. City Councilmen Carlos Menchaca and Daniel Dromm, who sponsored the measure, said the bill would allow a large section of the city’s marginalized populations to receive benefits and access to simple services like opening a bank account or renting an apartment. “Today, we’re living up to our highest ideals, and today we’re saying that no one should be left out,” she said. Officials said the ID card will be free of cost during the first year, adding that there will be walk-in enrollment centres along with online applications.